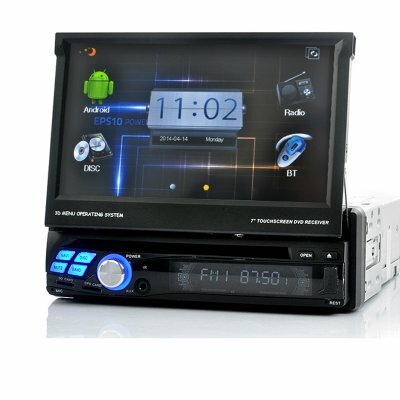 Successfully Added Universal Car DVD Player - One Din, 7 Inch Touch Screen, GPS, Wifi to your Shopping Cart. Turn this pleasure device into a tool during your journeys with the GPS function, which guides you via a vast list of features such as Lane Assist, Voice Guidance, Intelligent Route Planning and Points Of Interest (POI). Surf the internet for information. This can be done easily by inserting a 3G dongle or a Wi-Fi dongle into this single DIN car DVD player. Bluetooth connectivity is available so that you can sync your phone with the single DIN car DVD player to make phone calls by means of the system while guaranteeing that both hands are on the wheel. Save files on the DVD player’s 8GB of internal memory so you can watch movies or listen to music directly. If 8GB is not enough, then you can insert a micro SD card into the built-in port to expand the storage space up to 32GB. Never miss your TV shows as this 1 DIN car DVD player has built-in analog TV to make sure you will always be able see your favorites wherever you are. In stock now, this car DVD player can be dispatched within one working day of ordering and comes with a 12 month warranty. Brought to you by the leaders in wholesale electronics and car DVD players, Chinavasion.